I didn't know Spain played away friendlies. Will they bring their refs? Australia-USA on August 22 and 24 in Melbourne. Wonder if we'll squeeze in another game (China? Korea?) prior to the start of the tournament on the 31st. I guess we could also fit in a game between the Vegas scrimmage and Spain. FIBA W’Cup: Can D’Tigers Surpass Second Round Best Outing? The NBBF 2nd Vice President, Babs Ogunade dispelled such insinuations on Wednesday in an interview. According to him, the NBBF used the qualifying tournament to have a look at many players as possible, especially after qualification for the tournament was assured. “There won’t be fringe players,” said Oguade, adding, “There will be six NBA players with our best players playing in Europe. We are going to China with our best. But everybody will fight for a shirt. There won’t be bench warmers,” I can assure you. Some of the players that stand a chance of making the team are 6’4″ shooting guard, Joshua Okogie, who plays for the Minnesota Timberwolves of the National Basketball Association (NBA). Also likely to get a good look is 7’4” Ekpedeme Friday Udoh who stars for the Utah Jazz of the NBA. There is the homeboy 6’9” Al-Farouq Aminu with Portland Trail Blazers. There is Captain Ike Diogu, who plays for Sichuan Blue Whales, a Chinese club. Ogunade promised that the two likely ‘bigmen’ will be an NBA player. In order to give the NBA players the assurance they need, Kida will meet with the players one by one. “The players need that kind of assurance. They need somebody to assure them,” said Ogunade. There is however the issue of the players’ welfare, a knotty issue that was responsible for some of the players deciding not to play for Nigeria again. Ogunade assured that the issue of welfare won’t be a problem. In that the NBBF decision was to ensure that the players were respected and given the recognition they deserve. “Common these players are wealthy. They can buy off everybody in the federation. But we are going to let realize that we appreciate them with the sort of accommodation, the sort of transportation that we will give them,” Ogunade noted. “We will make the players understand that playing for Nigeria is honour and glory. We will make them understand that basketball is not football in Nigeria that gets all the attention. But we will give the players the best welfare we can give. Group B, along with Russia, Korea and Nigeria). 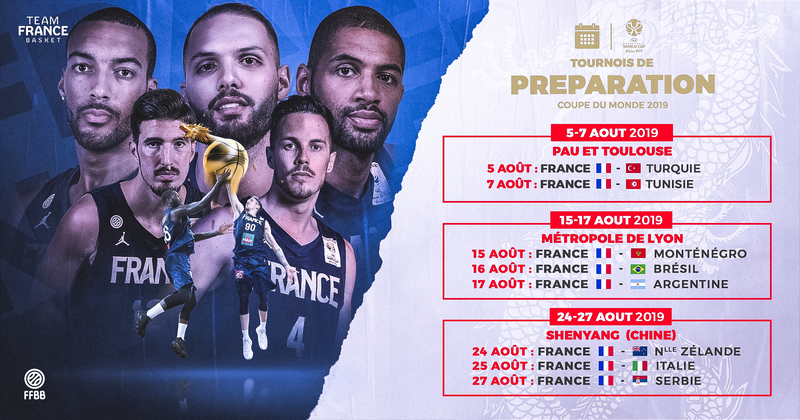 * Friendly tournament, from August 15 to 17, in France, Lyon, with Brazil, Montenegro and France (in that order, consecutive days). * Friendly against Japan, where they will face Julio Lamas's team, on 22 August , in Saitama. * Two Friendlies, already in China (specifically in Nangbo), against Russia and Spain (August 26 and 27). Last edited by lemo; 03-30-2019 at 09:33 PM. The national team is in Group D of the World Cup with Serbia, Italy and Angola. New Zealand is in Group F with Greece, Brazil and Montenegro, while Australia is in Group H with Canada, Senegal and Lithuania. Guiao said that playing either in tune up games or an international tournament like the Jones Cup in Taipei is “very important” for Gilas. Since the PBA board, following its meeting late last month, is hesitant on disrupting its schedule that it turns down already the idea of playing in the Jones Cup, Guiao said playing Australia and New Zealand could be a good replacement. Guiao pointed the Aussies and Kiwis have the same style as European basketball. The Serbians are currently ranked No. 4 in the world while Italy is No. 13. Australia is at No. 11 while New Zealand, though it is at 38th, has defeated the Philippines during the FIBA Olympic Qualifying Tournament held at the Mall of Asia (MOA) Arena in Pasay City three years ago. Looks like Canada and Australia are setting up for a two game series in Perth. not well thought exhibition game. Sergio Scariolo's team will face their first match in preparation for the World Cup by facing the Lithuanian National Team in Pamplona Friday, August 2nd. Sbp is doing a great job organizing for our team..
And the Philippines will be given by the PBA 10 days to prepare. This is disgusting. "Kuhanin nila gusto nilang players, kahit anong oras sila magpractice. Bibigyan namin sila ng 10-12 days na break," Marcial said.